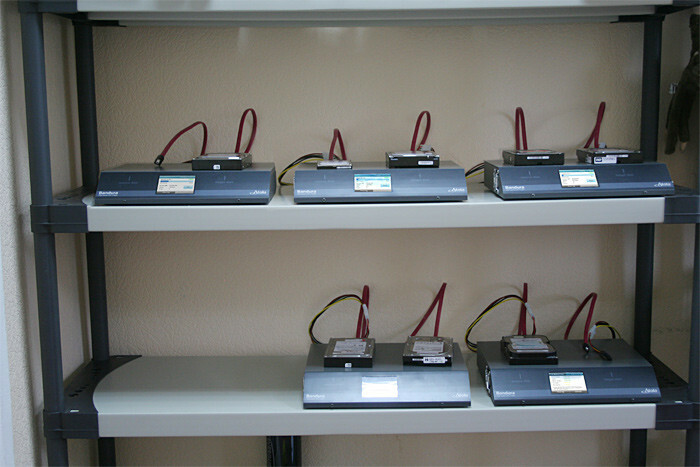 Bandura is a forensic standalone 2-port hard disk duplication and diagnosis tool. 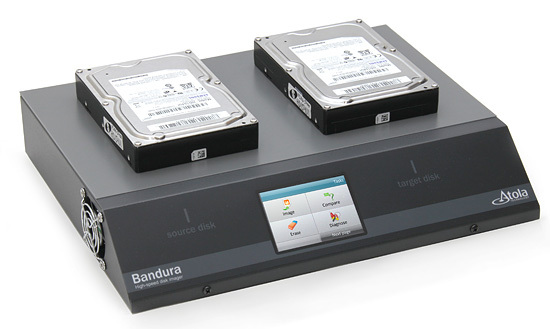 Bandura allows fast HDD duplication, automatic testing, comparison, and secure data wiping. It does not require a PC; the only thing it needs is a 100–240V AC power socket. Bandura can work with damaged disk drives and handles bad sectors properly. 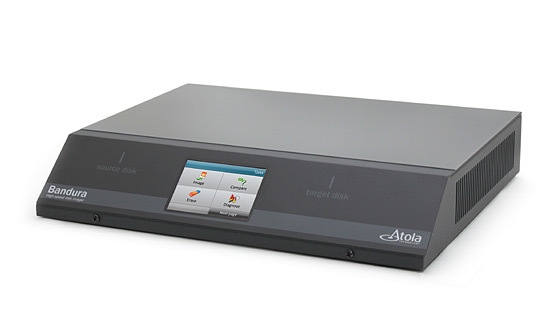 The tool features an intuitive touch screen user interface that allows launching any task in just 2 touches. Disk comparison (locate sectors that are different on two drives). Yes, that’s exactly what I was asking, and it would be great to see the Bandura with this feature, just something from the actual device that has performed the operation to back up any documentation that we issue to the client. Thanks, I’m looking forward to the next firmware update. The last one was a major improvement to the Bandura, and my unit is working very well... Thank you and to all the guys at Atola for your hard work. I just purchased an Atola Bandura from Ji2, Inc. after a demonstration at their offices. I brought two drives with me which I had been unable to recover using a Ureach duplicator. The Bandura recovered both drives, I gave Ken my credit card and brought the Bandura back to my office in Los Angeles. Since that time I've recovered 3 more drives from customers, all of which I had previously failed to recover. The Bandura is an impressive tool and worth every penny. Super-easy to use. Features 3.2-inch full color touch screen display.